EXTENDED Submission rates end OCTOBER 3, 2018 for #NDHFF18. 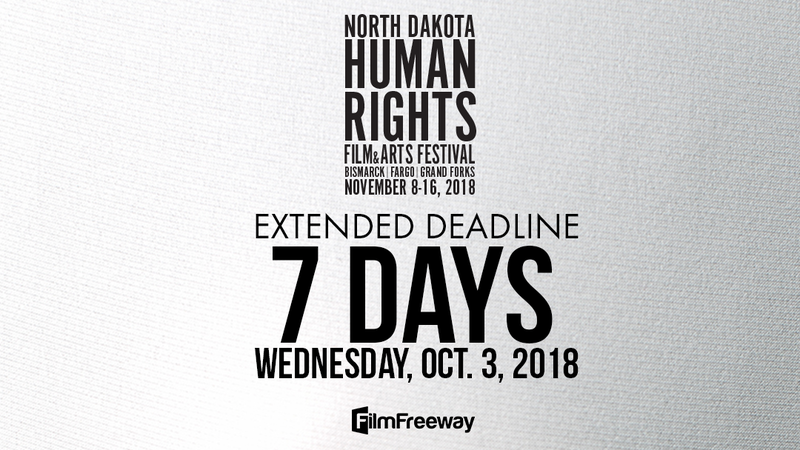 Extended submission rates for filmmakers to the 2018 North Dakota Human Rights Film Festival is ending in 7 days. Filmmakers should submit their films via FilmFreeway by midnight Wednesday, October 3, 2018 to be considered for this year’s festival. This is the last opportunities for filmmakers to submit their work in 2018. The film festival encourages filmmakers from around the world who have produced feature length or short documentary, narrative or experimental films that engage human rights related topics or themes to submit their work to the festival. While the festival rules out films that contain unacceptable inaccuracies of fact, films are not barred on the basis of a particular point of view. Films from both new and established filmmakers will be presented. International filmmakers are welcome to submit their work. Films for the festival will be selected via Jury, with equal concentration on human rights content and artistic merit. In 2018, selected films and filmmakers will have the opportunity to have their films screened in three cities in North Dakota: In Grand Forks, North Dakota on Thursday, November 8 at the historic Empire Arts Center; in Bismarck, North Dakota on Tuesday, November 13 at the North Dakota Heritage Center and State Museum; and for two nights in Fargo, North Dakota on Thursday, November 15 and Friday, November 16 at the historic Fargo Theatre in Fargo, North Dakota.